You are here: Home / Big Picture / One More Thing on NBER Report: Where did pre-2011 data come from? Earlier today I critiqued the new National Bureau of Economic Research (NBER) report on the “The Returns to Online Postsecondary Education”, calling it "a hot mess that that conflates online students, enrollments, programs, institutions and uses a bizarre and misleading data set for its analysis". That post looked mostly at the interpretation of Integrated Postsecondary Education Data System (IPEDS) data to define which institutions were exclusively online or substantially online based on the author's definition. 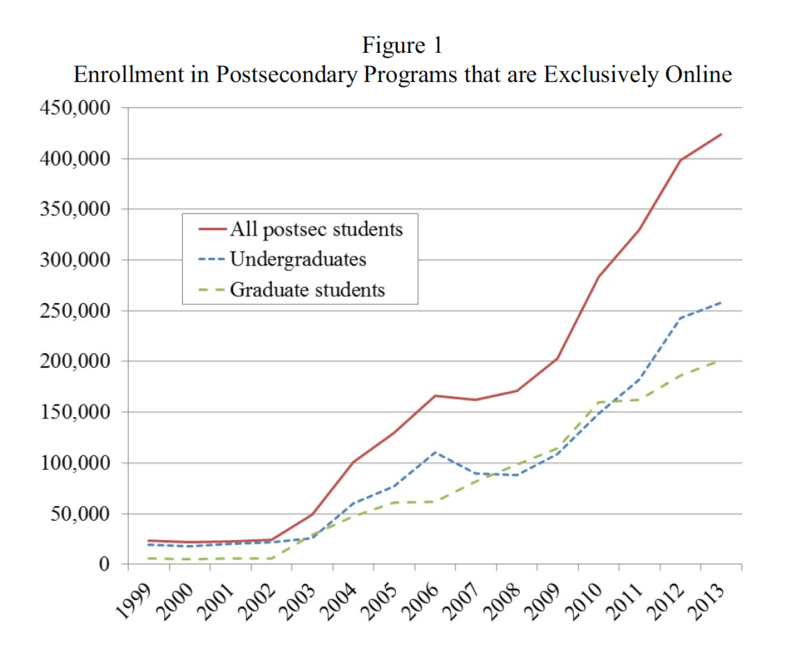 But this report has a bigger flaw that I initially missed - it shows historical data on online enrollments from the late 1990s and claims to analyze in detail online enrollment data from 2009 - 2014, yet IPEDS did not collect distance education data until 2011. (1) Are all programs at your institution offered exclusively via distance education? (2) How many degree/certificate-seeking undergraduates are (a) enrolled exclusively in distance education courses, (b) enrolled in some but not all distance education courses, (c) not enrolled in any distance education course? (3) Repeat question (2) for non-degree/certificate-seeking undergraduates and for graduate students. 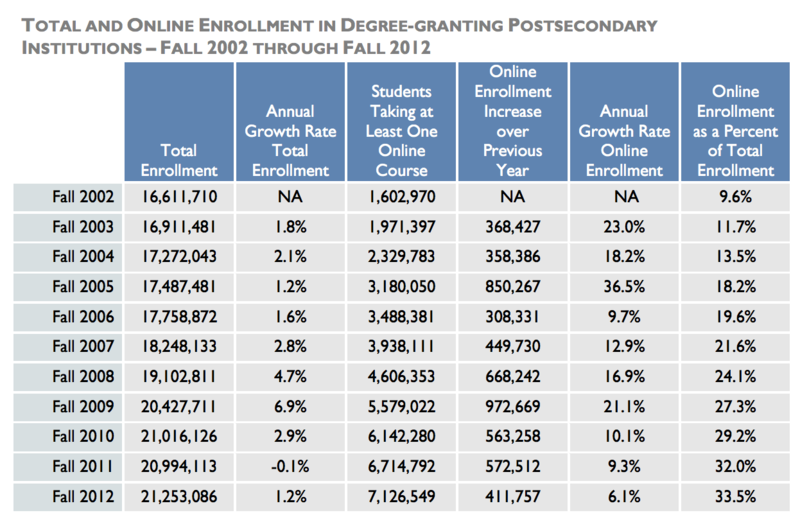 Figures 1 and 2 show historical online enrollment data. The problem is that IPEDS did not add the distance education data referenced in the data description above until the Fall 2012 term. Prior to that term, there were only two other sources of data from the National Center for Educational Statistics (NCES), host organization for IPEDS and part of the Education Department. Starting 2011, IPEDS collected data on institutions for which "All programs offered completely via distance education". 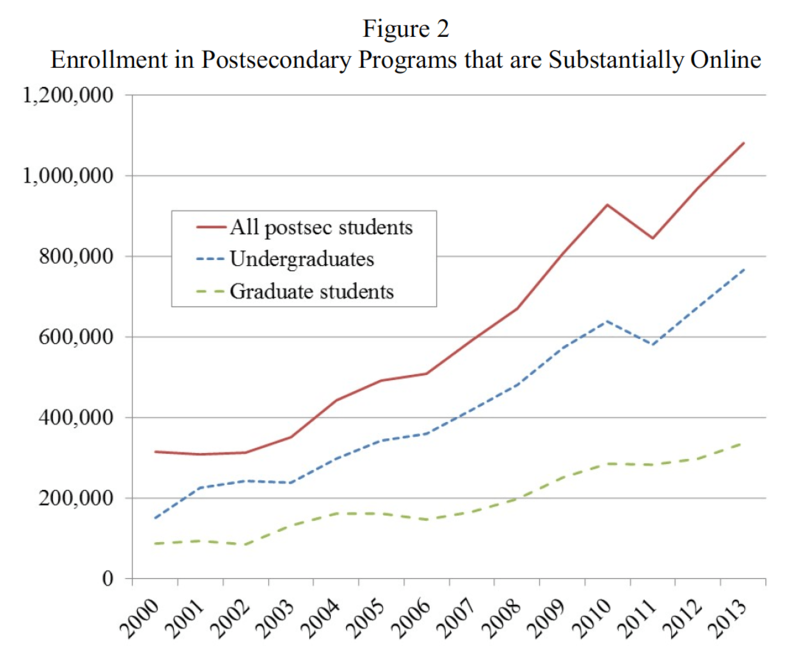 This was augmented with the broader distance education data starting Fall 2012. Study, which were conducted during the 1999–2000, 2003–04, and 2007–08 academic years. These were not part of IPEDS, and there was only data for those three specific years. Yet figures 1 and 2 show data back to the late 1990s with annual updates. Figure 3 from the NBER report makes it even more clear that the NBER report claims to have online enrollment data for every year within the study. Yet this could not have been the source of NBER data as it did not differentiate between exclusively online and substantially online, and the data shows far higher enrollments than does the NBER historical data. By checking the references in the NBER paper, there are a set of three papers authored by Deming et al that might give a clue. Good to see that acknowledgement. 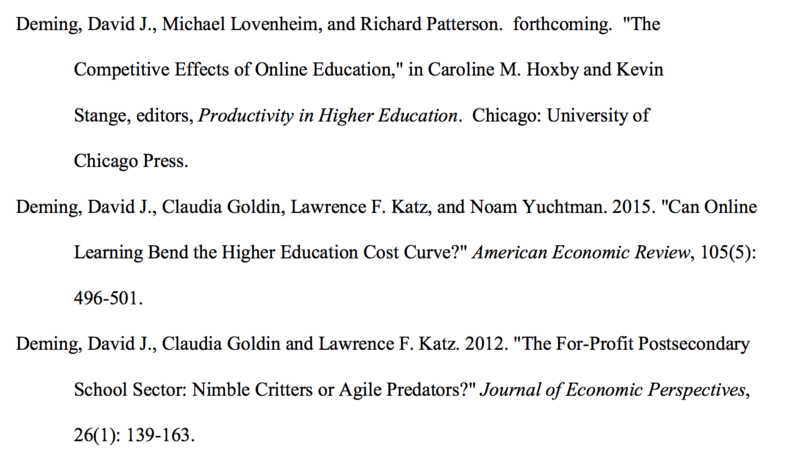 Initially I discounted the third reference (2012) as it was on for-profit institutions and not online education more broadly. But maybe we should look there. In this paper we find the following chart. A for-profit institution is classified as "online" if it has the word online in its name or if not more than 33 percent of the school's students are from one U.S. state. The "online Appendix" with further details mostly shares regression models and student loan default data while confirming the interpretation of what is an online institution. 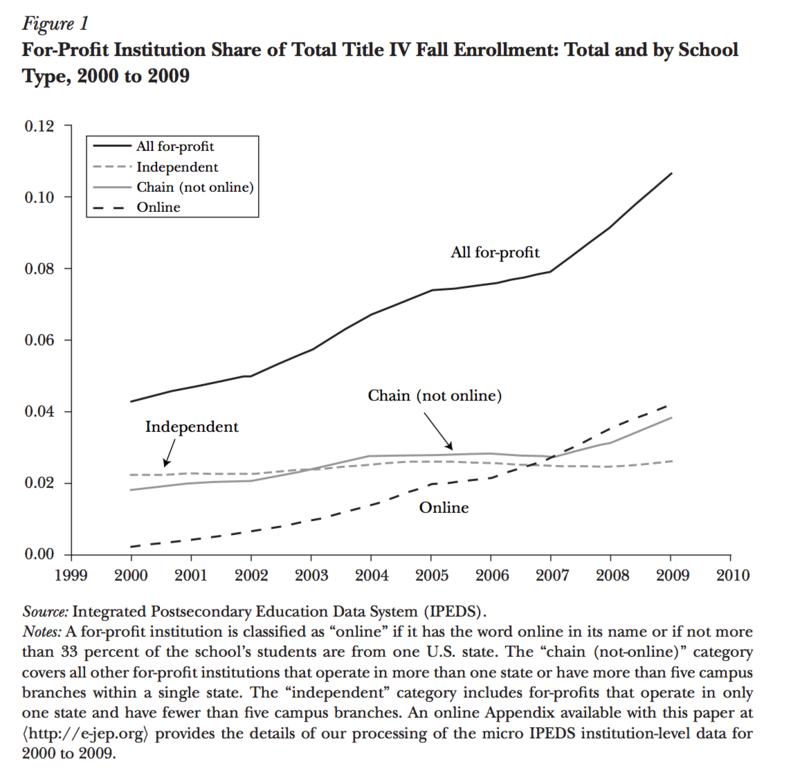 This is the closest I could find to historical data based on IPEDS that might support 1999/2000 through 2011 enrollment data for online education. But it is only for for-profit sector, and the data does not match that shown in figure 3. 1999 / 2000 thru 2008 - used only in figures 1 - 3 to set the historical context for the study and claims of explosive growth after 2005 (despite the graphs not supporting this claim directly; figure 1 growth really starts in 2008, and figure 2 growth is fairly consistent through 2008). There is no apparent source for this data, but the closest guess is some variation of the Deming heuristics. 2009 thru 2011 - used directly in the analysis that claims to analyze "longitudinal data on nearly every person who engaged in postsecondary education that was wholly or substantially online between 1999 and 2014". There is no apparent source for the enrollment part of this data. 2012 - 2014 - used directly in the analysis and for which IPEDS data existed. 2013 data analyzed in detail in the data tables. If I am missing something and there is a source of reliable IPEDS data on online education pre-2011, I would love to see it. And I will update this post accordingly. But until then, this is troublesome.